It’s that time of the year again! This monsoon it’s raining prizes in various disguises. Make sure to put on your best skill game and get on with it. Calling out to all poker enthusiasts to come and #SkillSeKarKill because Poker is a skill based game and not gambling. With multiple tournaments and over 1600 people playing poker online daily, TheSpartanPoker.com is India’s leading & most credible online Poker gaming portal. It is an online gaming hub that brings the quality of a world-class online gaming platform to gaming fanatics in India. TheSpartanPoker.com has a variety of Poker tournaments, offers and game offerings. 2. Is TheSpartanPoker.com credible and trustworthy? Offering unmatched technology, software and customer service, TheSpartanPoker.com operates under the highest standards with regards to payments, transaction management and player support. The payment and transactions management infrastructure at TheSpartanPoker.com is specifically built keeping in mind the unique needs of Indian players. To ensure completely fair gameplay when it comes to randomizing game events, the portal is certified by an international authority called iTech Labs. 3. What is the India Online Poker Championship (IOPC)? 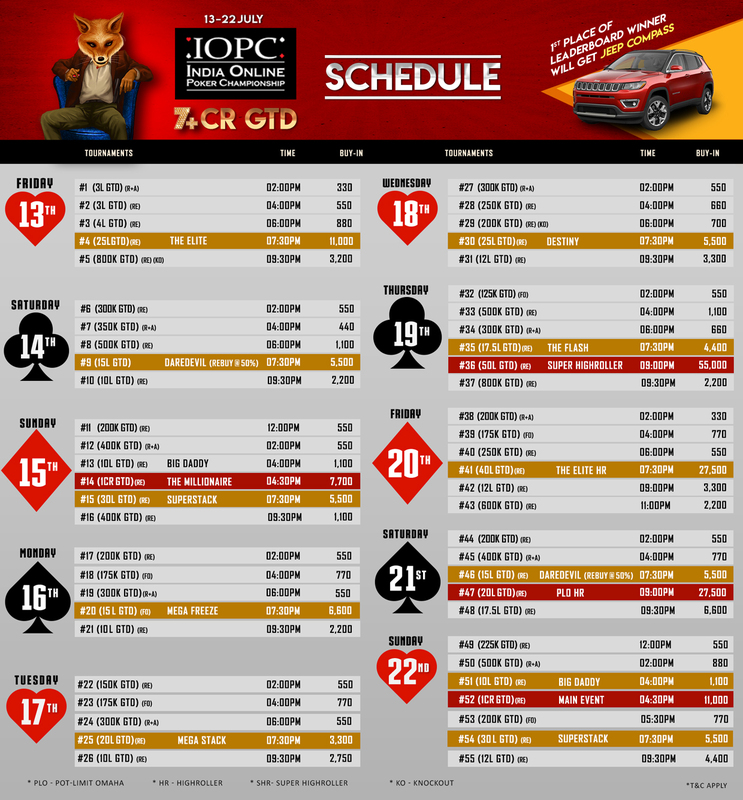 India’s Biggest Online Tournaments series IOPC is taking place on TheSpartanPoker.com. The flagship event, India Online Poker Championship, which has been held each year is a mega event with players from all across India. The event is expected to witness participation from poker aficionados from across the length and breadth of the country and is going to be a 10-day fiesta of 56 tournaments. 4. What is the Indian Online Poker Championship (IOPC) gratification? The online tournament is going to gratify winners with INR 7 Crores in prizes. In addition to this, there are leaderboard prizes worth more than INR 30 Lakhs on offer for the participants. The player to top the Leaderboard gets a luxurious Jeep Compass and the player to claim second place gets a swanky Bajaj Dominar. Aside from that luxury SUV and Bajaj Dominar, other prizes include a Bose Sound Bar, an Apple Watch and many more lucrative cash and gift prizes. 5. Why should you participate in the IOPC? 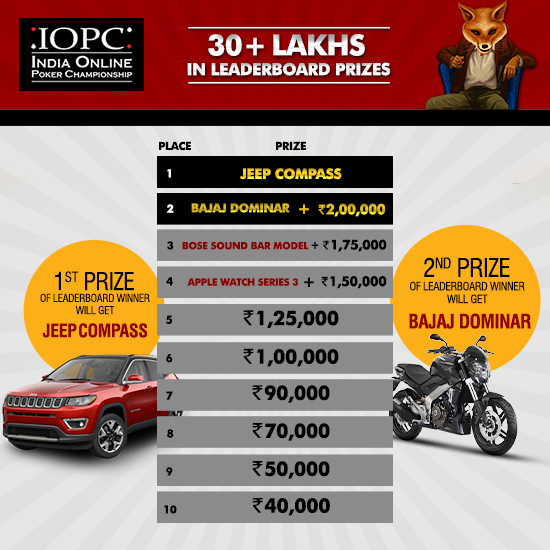 An individual can win upto 25 Lakhs in this IOPC tournament series. There are 16 featured events this time with huge cash prizes and giveaways at various stages of the game. The main event and the millionaire round will be the attraction of the gala with both the events offering 1 crore each to the lucky winners. Thankyou for this post. Its very inspiring.